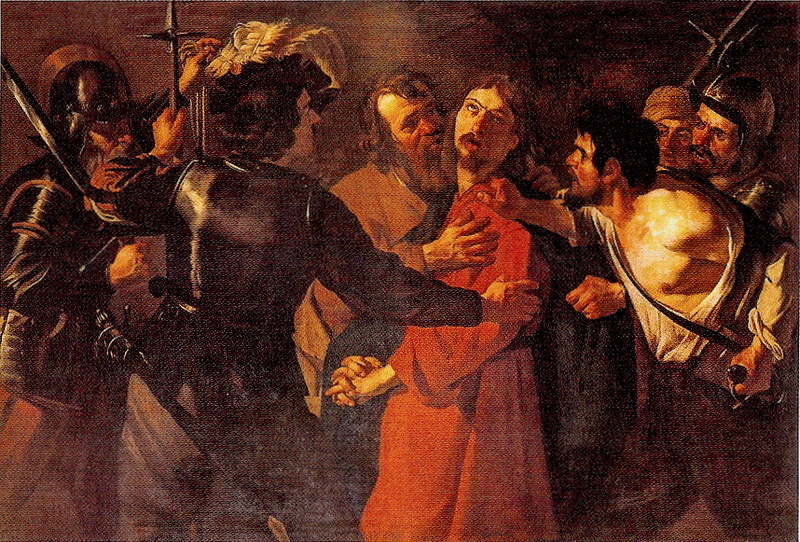 Artwork: Dirck van Baburen, The Arrest of Christ, c. 1619. Oil on canvas, Galleria Borghese, Rome. 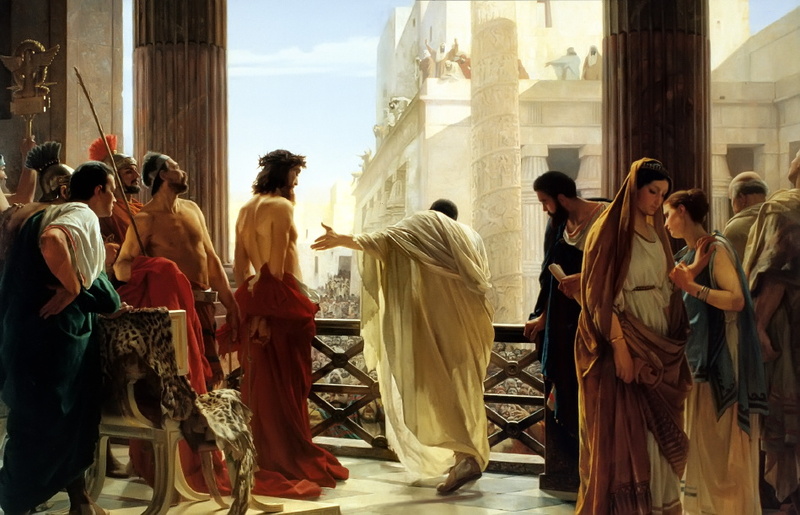 Artwork: Antonio Ciseri, Ecce Homo, 1880-91. Oil on canvas, Galleria d’Arte Moderna, Palazzo Pitti, Florence. Artwork: Vittore Carpaccio, The Meditation on the Passion, c. 1510. Oil and tempera on wood, Metropolitan Museum of Art, New York. 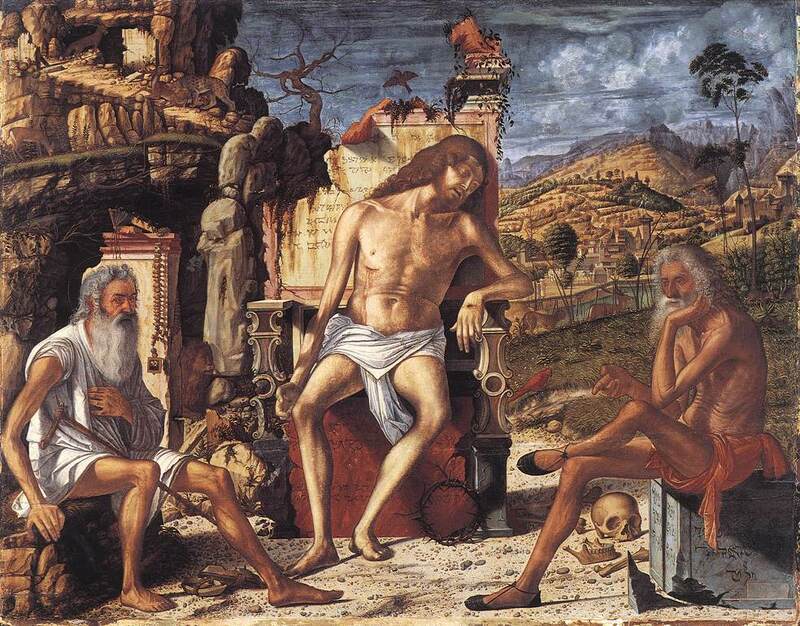 Carpaccio’s painting depicts Saint Jerome as a hermit (left) and Job (right) meditating on the dead Christ. Inscribed in Hebrew on the marble block where Job sits are the words “I know that my Redeemer liveth” (Job 19:25). And so it begins, and ends. We begin today with the exultant cries of “Hosanna”. We will end on Easter with the joyous cries of “Alleluia,” the alleluias that shall never end. Palm Sunday marks the beginning of one long continuous service, going from strength to greater strength, from joy to greater joy. And in between? Well, that is the point of Holy Week. And, indeed, it is not too much to say that there is no going from the beginning to the end without going through the middle; no Easter that has any meaning apart from the events of this week which we call Holy Week. In a way, there is no beginning either without, at least, a glimmer of an awareness that there must be a continuing in what we have begun today. How could there not be? The contrasts of this day are just so great. We who cry “Hosanna” are those who cry “Crucify”. The alleluias of Easter will be but the empty words of the hollow culture of empty souls and empty churches without the moving, heart-rending and mind-blowing spectacles of Maundy Thursday, Good Friday and Holy Saturday; in short, the triduum Sacrum of Holy Week. Such is the intensity of the Passion of Christ. There is no greater joy than the alleluias of Easter, but it is a joy that is borne out of the sorrow and the grief of this week. The contrasts of this day are the contradictions of our souls. More than the mere fickle nature of mob culture that swings from one moment to the next in the madness of unreason, we contemplate the depths and heights of human loves and human hates in all of their disorder and disarray. It is not too much to say that in the pageant of Holy Week there is little, if anything, that is good about ourselves. We confront the contradictions of our humanity. That is, really, the good of Holy Week. Saturday, May 8th, 4:30-6:30pm: 5th Annual Lobster Supper. Click here for more information.